In this excellent debut novel by a newly transplanted Nebraska author, Jennine Capó Crucet demonstrates that she is a gifted writer who can create strong multi-dimensional characters. Relocating to Nebraska from Miami, she teaches English and Ethnic Studies at the University of Nebraska-Lincoln. 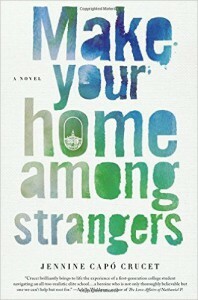 In Make Your Home among Strangers: A Novel, Lizet leaves Miami to venture north to an Ivy League school for her first year of college. The change in climate is not the only thing she has to get used to in her new environment. Besides adjusting to a very different life—academic and social—she has to traverse some unanticipated emotional territory. Learning to live with people with very different backgrounds and expectations than she’s ever been exposed to is just one part of the adjustment process. She also has to manage her own feelings about those she left at home—and maybe left behind? (And what a great colorful crew of well-developed, interesting characters they are!) Lizet has to decide how much her sense of responsibility for family and friends at home will trump her own needs—where the past ends and her future begins. She has to deal with managing her own expectations about her ability to help and steer the ones she loves vs. her ability to do this for herself in her own life. All of this is explored in the context of very engaging storytelling and true-to-life dialog. We come to really care about Lizet and her family. I found myself really cheering for them all by the end of the book. This story is fun to read and I really enjoyed the author’s wicked observations of human nature—portrayed with gentle humor, not malice. There’s a fascinating sub-plot about what goes on in Miami’s Little Havana while Lizet is away at school and it leaves the reader wanting more of that story about Lizet’s family and friends. I hope I get to read about what happens next for them. Welcome to Nebraska, Jennine Capó Crucet. We can’t wait to read the rest of your stories. This would be a good book for library book clubs. They would have a great time reading this book—and talking about it. Maybe you could even persuade the author to come to your library to make a presentation. I would love to come to that program!